It has been a busy weekend for the Integrated Homicide Investigation Team. Two Richmond residents — a man and a woman — were both stabbed to death in a McDonald’s restaurant in Richmond on Friday (August 28) night. A 33-year-old man is in custody and will make his first court appearance on Monday (August 31) or Tuesday (September 1). 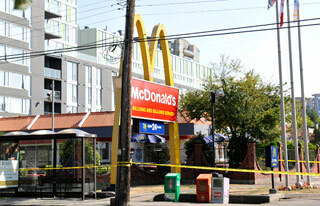 The assault occurred in the McDonald’s at the corner of Granville and No. 3 Road in Richmond. The IHIT has not released the names of the deceased. Three witnesses have been contacted, and investigators would like to speak to two males who were inside the restaurant at the time of the attack. One wore an orange and brown shirt, and the other had a red bag; both left the restaurant. METRO VANCOUVER — A Richmond man whose one-year probation for assaulting his wife had just expired has been charged with stabbing the woman to death in a Richmond McDonald’s last week. Court records show Chang Xi Wang, 33, pleaded guilty to assaulting Yan Lin on May 9, 2008, and received a conditional discharge on Aug. 26, 2008. He was given one year of probation and a one-year no-contact order — both of which expired just two days before Lin and her male companion Zhe Hu, were attacked late Friday. Lin was 36; Hu was 37. Both were from Richmond. Wang was arrested Friday night, not long after the attack. “Patrons and employees of the restaurant were quick to offer a description,” Cpl. Dale Carr of the Integrated Homicide Investigation Team said. Wang made a brief court appearance in Richmond Monday. He was charged with two counts of second-degree murder. He has been remanded in custody to await a bail hearing Sept. 14. No members of the family of the victims appeared to be in court Monday. Carr confirmed that Wang and Lin were married, although the court orders meant they would have been separated. “They were married, and the relationship to the other male, the police aren’t prepared to get into,” Carr said.